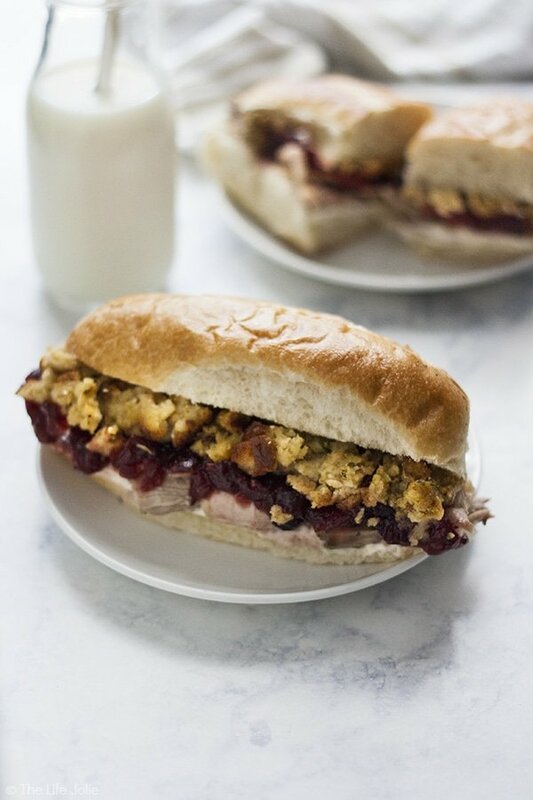 This Day After Thanksgiving Sandwich is one of my favorite recipes to enjoy leftovers! 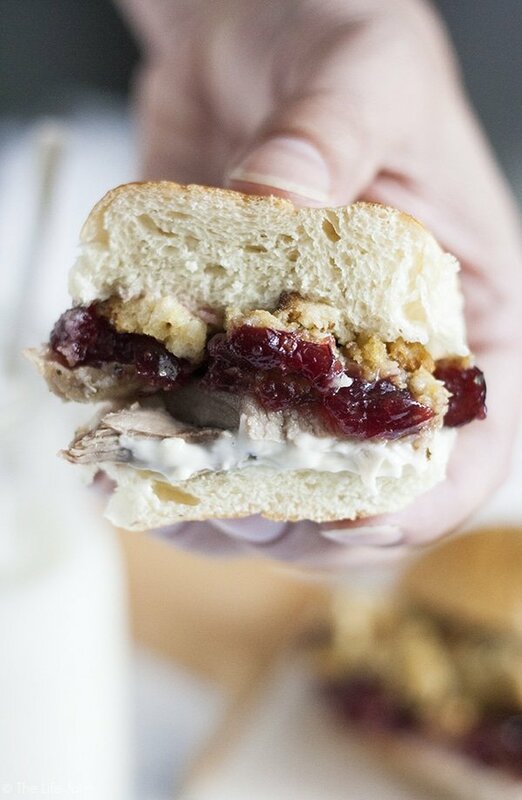 Tender turkey, sandwiched between halves of your favorite bun with tangy cranberry sauce, savory stuffing and mayonnaise. 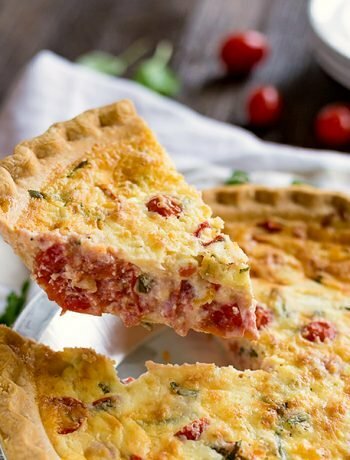 I love enjoying this for lunches or dinners around the holidays! So, last weeks post about Roast Turkey Thighs got me into a bit of a Thanksgiving mood. I know, you guys. And I’m sorry. I try to resist holidays this early, especially when the stores start hurling them into my face in August (am I the only one who feels like it gets earlier and earlier each year?). But the turkey! It called to me. And I started thinking about leftovers. I mean, who doesn’t love Thanksgiving leftovers? This also got me thinking of a sandwich shop J and I used to frequent when we lived in Las Vegas as newlyweds. My in-laws turned us onto it- a place called Capriotti’s, maybe you’ve heard of it? Capriotti’s has many amazing sandwich options to choose from, the their most popular sandwich would be The Bobbie. 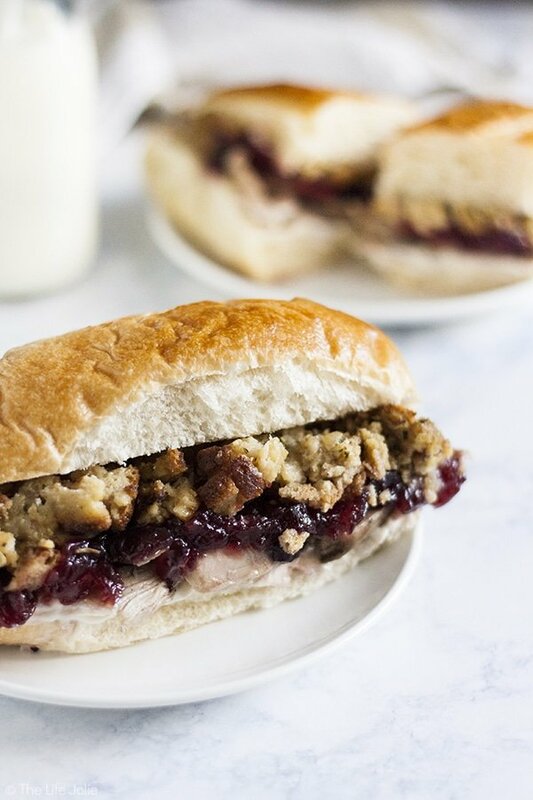 Imagine fresh roast turkey, stuffing, cranberry sauce and mayo on a hero roll. So pretty much Thanksgiving on a bun! I’m almost ashamed to admit that on my first time enjoying a sandwich from Capriotti’s, I ignored my mother-in-law’s good advice and instead ordered some sort of roast beef sub. Talk about poor decision making! I should have remembered that moms will never lead you in the wrong direction, at least in terms of food. But I was stubborn and I thought I was in the mood for beef. That sandwich was delicious too. But then she gave me a bite of her Bobbie and I instantly knew I’d made a bad decision in not ordering it. Luckily for me, she was generous enough to trade me half of her Bobbie for half of my roast beef sandwich (that, my friends, is love!). And from there I was hooked. In our short time in Vegas, I enjoyed many-a-Bobbie, each better than the last. And after we left, I dreamed of having a Capriotti’s in Rochester so that I could enjoy a delicious Bobbie once again (so if you’re reading this, Capriotti’s– come to Rochester! Trust me, everyone will love you guys as much as I do!!). Anyway, there I was, dreaming of The Bobbie with a plate of delicious Turkey leftovers. So the natural next step became apparent: I needed to recreate The Bobbie. And I did just that! Tender turkey, sandwiched between two halves of my favorite bun. 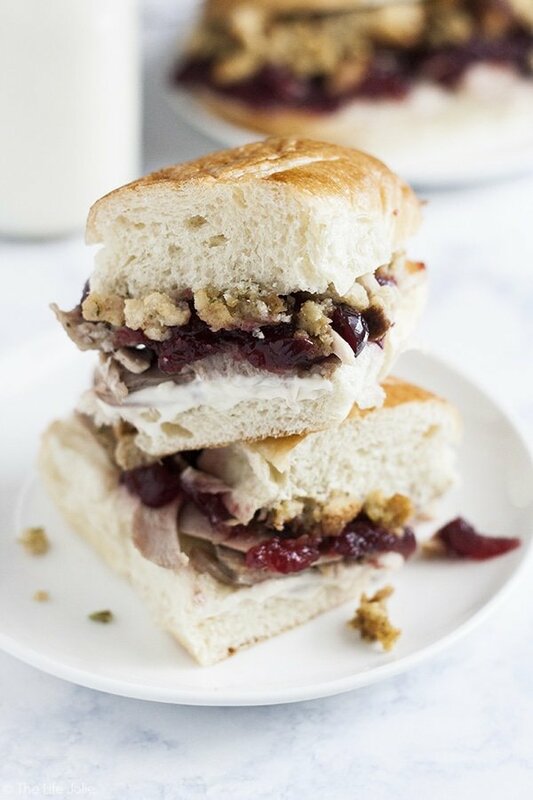 The savory stuffing plays nicely with the tangy cranberry sauce (go with the whole berry- the texture is excellent!). 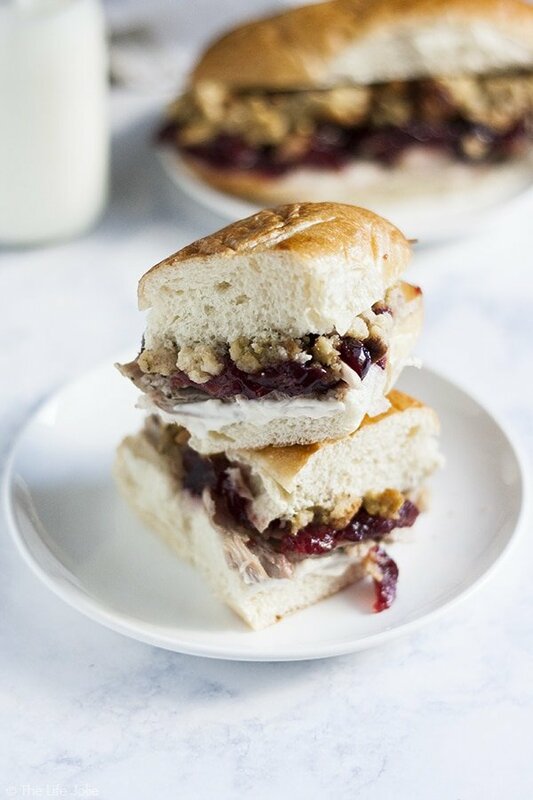 This sandwich is the most fantastic way to enjoy leftovers on the day after Thanksgiving. Pair it with some crispy chips, a nice big glass of milk and finish it off with a slice of Pumpkin Spice Latte Cake and Boom! You’ve got yourself a tasty leftover lunch or dinner! Spread some mayonnaise onto the bottom half of your bun- you you love mayonnaise, you can also spread some on the top bun. Season with salt and pepper to taste. Lay your pieces of turkey in an even layer. Top with a layer of cranberry sauce and then a layer of stuffing. Finish by adding the top bun.